I think the thing I liked best about the Bunch of Grapes was that it just has a nice atmosphere. It's a lively city pub with welcoming, homely elements. For example, when you first enter you will notice the pastries and snacks available on the bar, something we're more used to seeing in a cosy café than a drinking establishment. 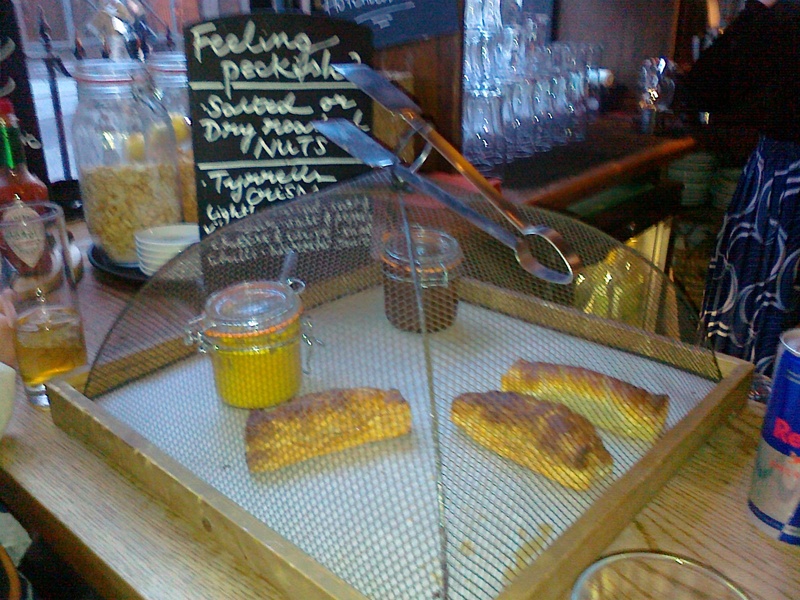 The bar staff were cheerful, the coffee reasonable, and the food good. There is a Victorian feel to this place which I think comes largely from the style of the lamps, dark-wood décor and one or two musty, patterned rugs. The main bar includes partitions made of the ubiquitous dark wood and as a consequence can feel a bit gloomy. I sat upstairs, where there is an impressive grand fireplace (dark wood again) that must be nice to huddle round in winter, and tall sash windows let in good amounts of sunshine. I sipped coffee, munched onion rings, and browsed the selection of books and board games on the shelves opposite. The menu includes some interesting options such as posh fish finger sandwich and a mini pie platter (featuring four 'award winning' pies) – food with gastro-pub leanings and which did seem to be very good from my experience. Generally, this appears to be a pub striving for a certain upmarket ambience but missing the mark with a few hints of shabbiness. For example, while the upstairs toilets had posh-looking 'wild fig and ginger' hand wash they were otherwise basic and had a large dusty boiler on the wall. And the stairs are carpeted with a floral design that looks like a relic from the 1970s and could do with some up-dating (or down-dating, to bring it in line with the general Victorian style). 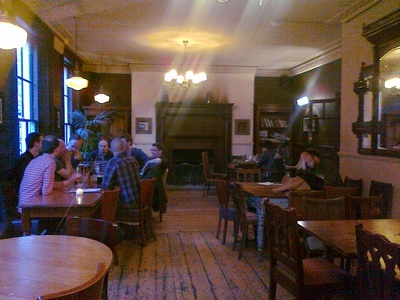 However, the Bunch of Grapes' best feature is its homely, welcoming atmosphere, which is created mainly by the friendly staff, the provision of board games and books, and the café-like touches. I think you'll find it an equally good place for a meal, a coffee and a chat, or a nail-biting game of eighties classic 'Market Madness'.